A clean car interior says a lot about the owner of the car. However, many people treat their cars like garbage cans often using the back seat as a repository for empty food bags, extra clothes and the like. Vacuuming the car is important to keep the car looking presentable but also to ensure your valuable car is well-maintained. Use the services of the high powered professional vacuum system available at local car washes to do a good overall job of picking up large debris from under your car seats. Today's cars act as an extension of our hectic lives. People consume a lot of food while driving. Soil and debris gets tracked into the car and can become embedded into the carpet where it can cause fabric fibers undue wear overtime. Open all the car's doors and remove the floor mats. Pull the front seats as far forward as possible and flip them forward to allow for the most working space and easier access to the carpet under the front seats with a rear approach. Professional vacuum systems are not made for fine detail work, but they do a good job of picking up the debris that easily falls between the car seats, such as french fries, snack crumbs and kids' candy. Vacuum the carpet on the car's rear floor here as well. Direct the vacuum system nozzle downward on the carpet and do a few suction passes with the vacuum directly into the carpet fibers to ensure soil and microscopic debris embedded into the fibers is captured. Use this suction technique also on the car floor mats as they are particularly susceptible to embedded dirt. Move to the front seat section and push the front seats as far back as possible to continue with the professional vacuuming under the front seats from the front. 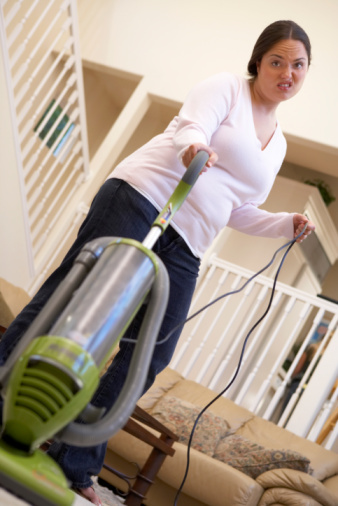 The nozzle on the professional system is much too big to reach down between the seats, so you'll have to use a smaller vacuum, such as a cordless hand-held car vac or even a home vacuum, if it has a long hose and a detail nozzle attachment. Clean the carpet under the front seats using a detail nozzle attachment. Be sure to pass the nozzle down in the area between the front seats and the middle console to get the carpeted areas there clean. Use the vacuum's nozzle to clean the crevice between the car seat's bottom section and the seat back. This should be done for both the front and back seats to remove food, loose coins and other debris that may have become lodged there. Marla Currie has written professionally since 1995. She is editor and publisher of The Urban Shopper, an online magazine whose consumerist content is targeted to Black and Latino females. In addition to short fiction, Currie is author of "The Humours of Black Life," a nonfiction work. She has a master's degree in advertising.